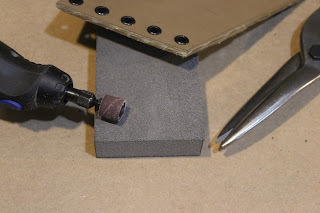 If you want to go pro, you’ll need a bunch of power tools.If you just want a professional finish, you only need one power tool and that is a Dremel or other brand of rotary tool, henceforth “RT”.You can find RT at almost any big-box store for anywhere between $40 and up.We’d recommend the Dremel brand or spend at least $60-100 on your RT.These tools are useful for many, many tasks, but for the Kydex enthusiasts, the most important is the “sanding drum” type head.Get the highest grit drum you can find. Crank your RT up on high and run it around the edges of your project.Wear your eye and filter maskprotection for this job.Smooth your edges out and bevel the edge corners. 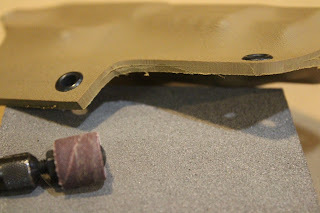 Your goal is to minimize the “tool marks” of the trimming process and smooth/straiten the edges as much as possible.If you’re working on a “pancake” type project, RT the “single” edges at the top and/or bottom and then assemble and shape your project before RT’ing the “common” edges. Hold the item with your non-dominant hand and try to lock it in against your chest.“Fly” the tool with your dominant hand.If you’re right handed, pull the RT in towards you.If you’re left handed, push the RT away from you (or just stop being wrong handed, seriously, they kill you folks in other countries.Why?So we don’t have to be bothered with making RT that run clockwise). 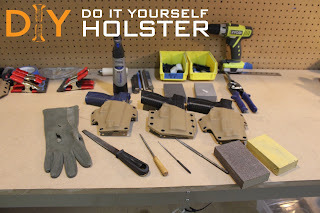 We won’t lie, this is one of the hardest skills to learn in the DIY Holster realm.When we say “fly” the tool we mean it.The end result of practice is worth it.However, if you cannot get it or want to bypass it with more elbow grease, stay tuned for part 3 (and make sure you have that Elbow Grease).